MANILA, Philippines – This month, Filipinos commemorate the People Power Revolution that ended a dictatorship and restored democracy in the country 28 years ago. Also this month, we commemorate one of the events that led to the declaration of Martial Law in the country – the First Quarter Storm. It was a period marked with a series of demonstrations against the government held mostly by student leaders from January to March 1970, or the first quarter of that year. Here’s a short timeline to show some of the highlights of this turbulent period. President Marcos delivered his State of the Nation Address at the old legislative building in Manila as the 7th Congress opened. About 50,000 demonstrators gathered at the Burgos Drive to demand for reforms in the Constitution. 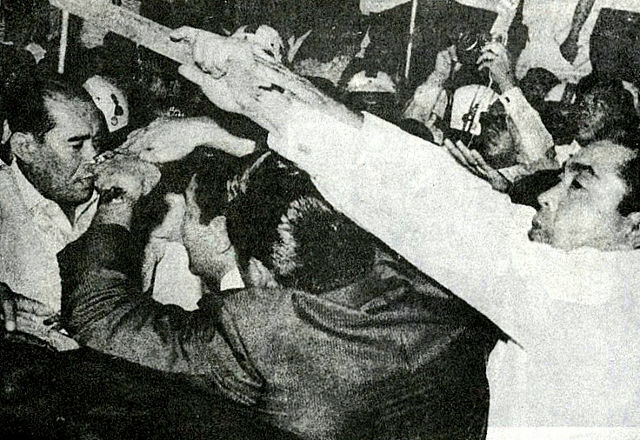 As Marcos left Congress and headed toward his limousine parked outside, demonstrators booed him and threw sticks and placards at him and his entourage. Anti-riot security forces attacked the demonstrators after Marcos left the scene. The riot reportedly caused injuries to 300 youth protestors and 72 law enforcers, and damage to vehicles and other properties. Congress demanded an investigation on the cause of the incident. Simultaneous demonstrations were held by the gates of Congress and Malacañang to call again for constitutional reform, and to air grievances against the police during the January 26 riot. Some demonstrators in Congress headed to Malacañang later that day. A firetruck, which earlier trained water on the demonstrators, was captured by some of them and driven to smash the gates. Security forces again attacked the demonstrators, with violence spreading even in nearby streets until the following day. Reports said 4 students were killed, 162 were wounded, and damages to property reached between P500,000 and P1 million, making it the worst student rally in history. The Armed Forces of the Philippines was placed on red alert, and Congress investigations were held after the incident. Some 100,000 demonstrators gathered in Plaza Miranda, with simultaneous rallies also held in 8 other areas outside Manila. The rally was fueled by the protestors’ rage over the death of 4 students and the injury of attendees in the January 30 gathering. Helicopters hovered over the demonstrators in the afternoon, but the gathering ended without violence. The rally was almost called off, as some student leaders agreed to a dialogue with Marcos on the eve of the demonstration. But they suddenly changed their minds and pushed through with the rally, the biggest demonstration ever, in Plaza Miranda. The People’s Congress was held in Plaza Miranda, with simultaneous gatherings reportedly held in 10 other provinces outside Manila. Attendees of the rally protested against US imperialism, domestic feudalism, and fascism. In the evening, some demonstrators marched to the US embassy where they threw sticks, stones, and home-made bombs which almost destroyed the embassy’s lobby. Some people were again arrested and beaten. American ambassador Henry A. Byroade claimed it was “wanton vandalism,” for which the Philippine government immediately apologized. A month after the violent SONA rally, protesters held another People’s Congress in Plaza Miranda. The rally was organized despite organizers being denied a permit to rally by then Manila Mayor Antonio Villegas. Security forces dispersed them, causing protestors to transfer to the Sunken Garden at the University of the Philippines in Diliman, Quezon City. They again marched to the US embassy where they had another violent encounter with the police. Violence spread until Mendiola, with reports of civilians merely crossing the streets being beaten. Reports said that 80 were wounded and 120 were arrested after this violent encounter. Not a single protester was arrested. The Movement for a Democratic Philippines (MDP) organized a People’s March, which started at the Welcome Rotunda at the border of Quezon City and Manila, and ended at Plaza Lawton in Manila. The march was accompanied by a partial strike of jeepney drivers. From Plaza Lawton, marchers proceeded to the US embassy, where they had another encounter with the riot police who prevented them from entering the premises. A second march was held, this time branded as the Poor People’s March which hit on the issue of poverty in the country. They proceeded to the US embassy, but left immediately after meeting the cops to avoid confrontation and headed to Mendiola where they lit bonfires in the middle of the road.